Apparently the big food trend is all about bold flavors. If you see something on the menu that has a "hint of..." just pass it up. That's so 2016. This year you want to be hit in the face with the flavor! 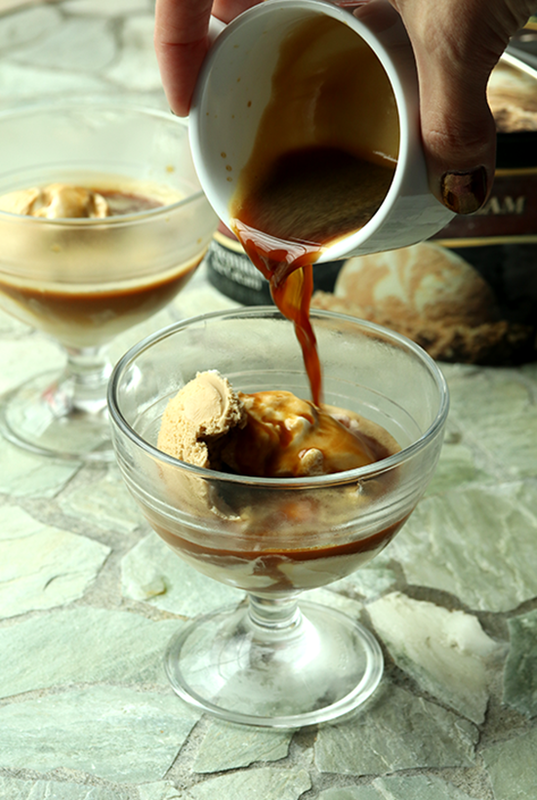 That is why we are indulging with a double coffee affogato for dessert today. 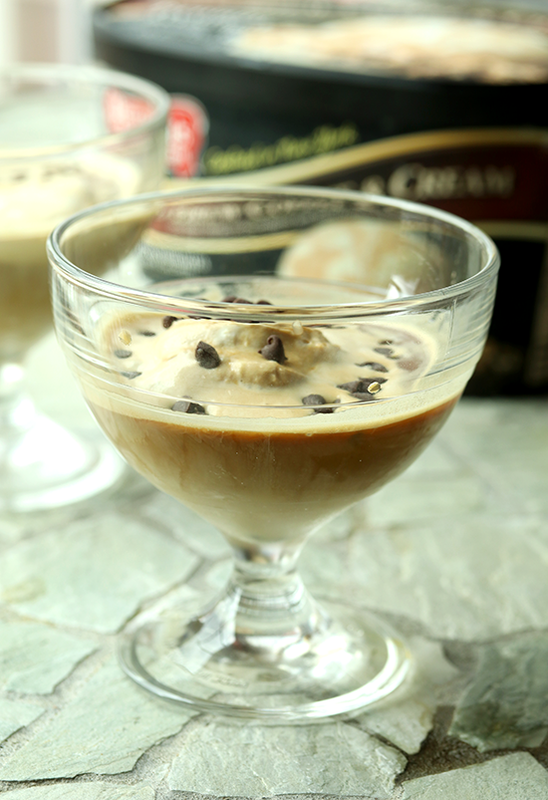 For this recipe you need two items - strong coffee and rich coffee ice cream. The boyfriend and I went to Cambodia last year and stayed in Siem Reap at the adorable Heritage Suites. The people were friendly, the pool was serene and above all, the coffee makers made top notch coffee. European style coffee. Tiny cups. This espresso was so amazing, that the boyfriend would constantly reminisce about our time in Cambodia and how really liked the coffee. At least once a month (usually when we'd pass the Nespresso shop), he'd talk about how good it was and how he wanted to find a local alternative. American coffee just isn't the same. After listening to this for about a year, I decided to try and bring a bit of Cambodia home for Christmas. First, I e-mailed the Heritage Suites Hotel and asked about their coffee machines. Turns out they use a French brand called Malongo. Next, I looked up the Malongo website and determined that they were located in Paris, France. I emailed them to find out if they made a US-friendly machine (i.e. 110 volts)... They do not. What else don't they do? They don't ship to the US! After much googling, I located a legitimate-sounding third party that would buy the coffee machine (and coffee pods) on my behalf. FAOPS (not sponsored, I was just really impressed!) will purchase goods from French websites and have them shipped to their warehouse in France. They then repackage your goods (into smaller boxes) and ship them wherever you are! The package with the coffee machine and pods arrived in just two days from France and I had the best christmas present ever. Since the machine is European and I live in the US, I had to buy a heavy duty voltage transformer to power the thing, but it is totally worth it. 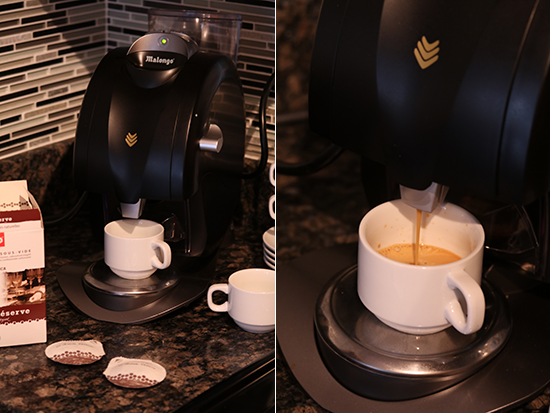 Even with the extra fees in shipping, I was able to get the coffee machine and 300 pods for less than the price of a nespresso machine. And now the boyfriend can enjoy a little taste of Cambodia (France?) whenever he wants. The Malongo machine is the source of my strong coffee that I paired with the newest ice cream flavor from Perry's - Cold Brew Coffee & Cream. Sticking with the 2017 trend of bold flavors, this coffee ice cream is no joke. 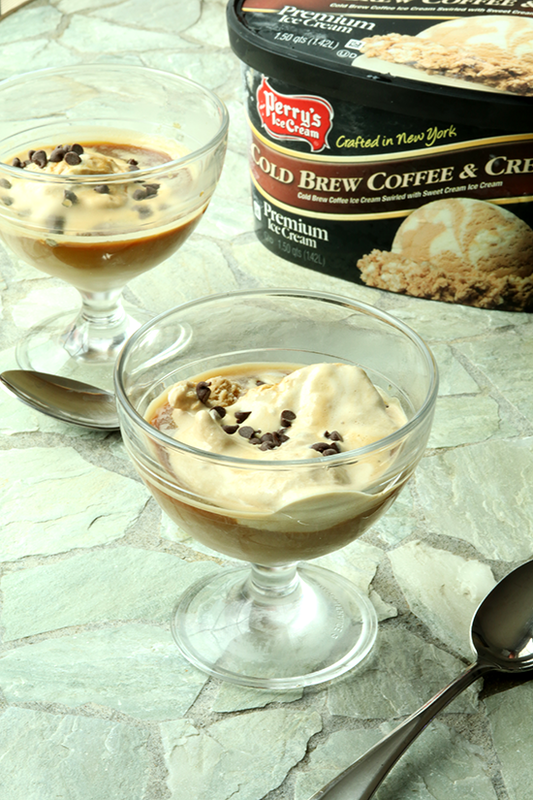 The coffee flavor is incredibly rich and intense, you really only need a scoop to satisfy your craving. The swirls of sweet cream help to balance out the whole thing. 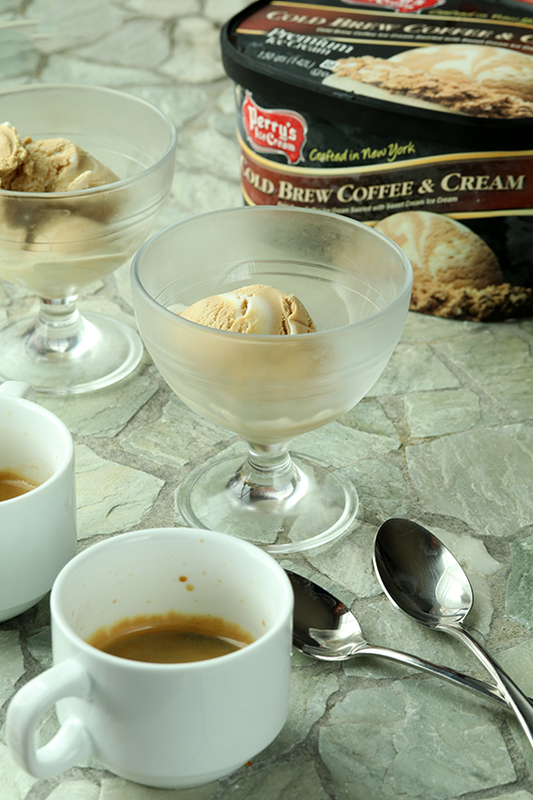 If you are looking for a simple dessert that your coffee-loving friends will enjoy, give the affogato a try. Give them a few options with either vanilla, chocolate or coffee ice cream! Don't worry if you don't have a fancy, difficult to source, European coffee machine. Affogatos are delicious with every kind of coffee! Sprinkle on some miniature chocolate chips for a subtle burst of sweetness. Disclaimer: As a members of Perry's Ice Cream Inside Scoopers program, they send me ice cream and I eat it! I receive no financial compensation for recipe development. I only work with companies that I love and believe in. Perry's Ice Cream is a brand from my hometown of Buffalo, NY. If you live in the Northeast and have access to a Wegmans, you can try Perry's yourself. Everyone else, you need to plan a trip to Western New York to get a taste!